In my experience, there’s one fundamental truth about house hunting: You can never fully escape the haters. That’s right. The haters. The only way to live a 100 percent hater-free life is to never stick your neck out, and never do anything, because, as the saying goes, you simply cannot please all of the people all of the time. You might think I’m beating a dead horse, here, or even preaching to the choir. But as long as house hunters keep emailing me to ask why, in the name of all that is sacred, they keep seeing homes that smell like all sorts of madness and mayhem, I’m going to keep repeating this message. Viewing a home sounds like it’s all about the visual of the experience. And visuals are critical — your listing should be in its Sunday best, so to speak, when it’s being shown, in terms of being spruced, staged and clutter-free. But when a buyer comes to see your listing, they don’t turn off the rest of their senses. And there is nothing that can turn a buyer off from a home they’d otherwise like more quickly than a powerfully bad odor. In particular, cigarette and pet odors in a house that seems to have been well-cleaned create the concern that they might be permanent and that the buyer might not be able to get rid of them without dropping some serious cash on cleaning or even removing wall, window and floor coverings. If you are listing a home and you know that someone has been habitually smoking in it or that the seller has had a “challenge,” let’s say, with pet accidents, do not ignore the problem. And do not think that because you had the carpet shampooed or the drapes cleaned, or because YOU can’t smell anything, that the problem is gone. The human sense of smell very quickly gets used to smells that it lives with or is surrounded with on a regular basis. It’s one of the tougher parts of your job as an agent to point out bad smells and odors, no matter how painful the conversation, and to make sure they are eradicated by any means necessary before you place your listings on the market. There’s the kind of overpricing that makes a buyer say, “Hmmm, seems a bit high. Let’s go see it, but we might have to offer a little less than the asking price if we like it.” Then there’s the kind of overpricing that makes buyer say, “I’ll wait until a price reduction,” or worse, hold their sides from laughing. When overpricing is glaring, many buyers and buyer’s brokers will comment on it or inquire about it. What they are less likely to do is actually come out and see the place, especially if they weed it out online after comparing its specs to all the other homes in the area and the price range. Often, homes this severely overpriced simply don’t sell, or not until after they’ve had some serious price cuts or have been on the market so long buyers begin to feel confident about making lowball offers. In fact, the goal is the opposite — you want your listing to stand out as a property that is not dirt cheap, but does present a good value for the money — that’s what motivates buyers to get out of their chairs and into the property for a viewing. Obviously, you don’t set the price of your listings. It’s also obvious that the agent-seller conflict about overpricing is one of those battles that have been fought since Adam and Eve sought to list the Garden of Eden. Here’s how to hater-proof your home’s listing against this issue: Force your sellers to fixate on the comps. Smart sellers deactivate their emotional attachment and very human tendency to overvalue their precious homes by poring over the sales prices (not list prices) of similar, nearby homes that have recently sold. Walk them through this data — don’t forget to show them the overpriced listings that are lagging on the market, and any value-priced listings that have sold for way more than asking. 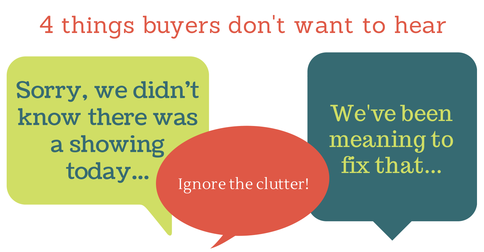 Possibly the single largest source of house-hater complaints I’ve ever heard are the dirt, messes, piles and personal belongings that buyers find so distracting when they walk into a home for a viewing or open house. Obviously, homes that are filthy from floor to ceiling are fertile fodder for haters, but often those homes are bank-owned or otherwise distressed so that the sellers aren’t likely to do much. What is underestimated is how often even savvy homebuyers are distracted (and disgusted) by relatively clean homes that just have a few outstanding messes, like piles of dirty dishes in the sink, piles of dog poo in the yard, or even piles of papers, mail, books or clothes lying out in plain view. Will one or two such items ruin the sale of your home? Perhaps not. But a few of them (or more) can certainly distract a buyer enough that they fixate on the home’s messes and, in the process, fail to see what is so great about your property. As I see it, cleaning up, meticulously, before every single showing is free — so it makes no sense to even run the risk of turning off a prospective buyer by letting messes get in the way of their ability to visualize themselves and their families flourishing in your home. Make sure you brief the sellers in detail on what buyers expect, in the way of cleanliness. Also, set up a plan for giving them enough notice of showing appointments that they can do a quick, but thorough, house cleaning pass-through before every single viewing. All of us tend to think our homes are in fantastic condition. After all, your sellers have had the furnace maintained regularly, they’ve installed granite and dual-paned windows, and maybe they even took your advice to have the floors refinished or the walls painted in preparation for putting the place on the market. That’s all fantastic — all the noncosmetic work that’s been done to maintain and improve your listing should be trumpeted in your marketing materials, and thecosmetic items will (or should) speak for themselves. But here’s the thing: House hunters won’t be running the dishwasher or testing the furnace (at least not until inspections). Flick light and fan switches. Open or close window coverings, closet, room and entry doors. Open and close drawers, cupboards, gates and fences. Hold the handrails as they walk up and down the stairs. They will hear leaky faucets and point out water spots from long-ago-repaired leaks, and they will notice (or potentially trip on) uneven exterior tiles, paths and walkways. And even though these items might be vastly less expensive to fix than the roof or sewer line you had replaced, they are much more visible and noticeable to a buyer. In fact, buyers don’t always even know that the little malfunctions and repairs that need doing are little or inexpensive. And when they notice a bunch of these sorts of things in a single property, they can jump to the conclusion that the whole place is rickety. Since these little fixes are inexpensive to make, have them completed before you list, if at all possible. You might even ask your seller to walk through the property with you, pinpoint all the necessary little fixes and offer the a handyperson reference for someone you know works efficiently.